Joe Mixon of the Oklahoma Sooners reacts after a touchdown against the Auburn Tigers during the Allstate Sugar Bowl at the Mercedes-Benz Superdome on Jan. 2, 2017, in New Orleans. 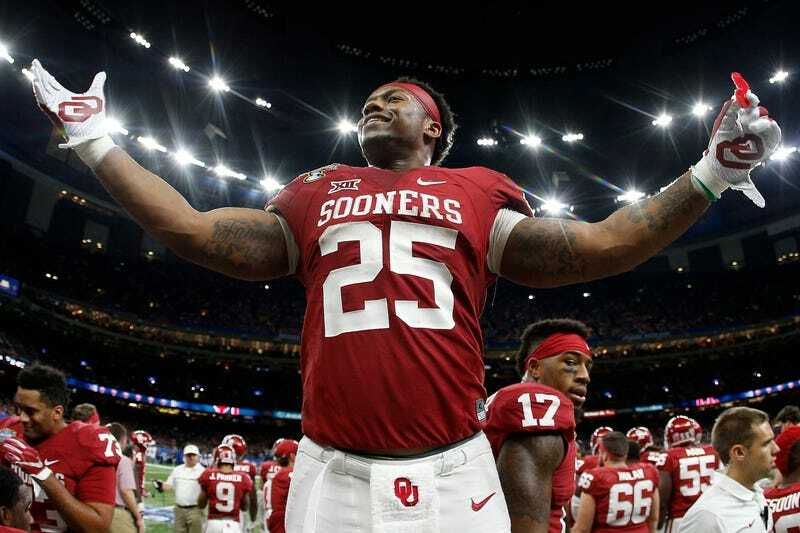 University of Oklahoma running back Joe Mixon, who was caught on video punching a female student in the face in 2014, announced Thursday that he is leaving college to enter the 2017 NFL draft, NBC Sports reports. Mixon sat out the 2014 season after the university was informed about the incident, which left the female student with four fractured bones in her face. In his last two seasons, Mixon starred at Oklahoma, rushing for over 2,000 yards and scoring 26 touchdowns. The student has filed a lawsuit against Mixon, which is pending, and the altercation became national news after a court ruling made the video public. Mixon and his attorney decided to release the tape after the court's decision, which pushed the incident into a national conversation about player privilege. Oklahoma coach Bob Stoops said that at the time he thought Mixon's suspension from the team was an appropriate punishment, but added that if the incident happened today, Mixon would have been dismissed from the team, NBC Sports reports.